Mike Holland, treasurer of the Watson-Watt Society of Brechin, has paid tribute to the many ordinary individuals, groups and small firms that have made donations to the Society over the last few years. 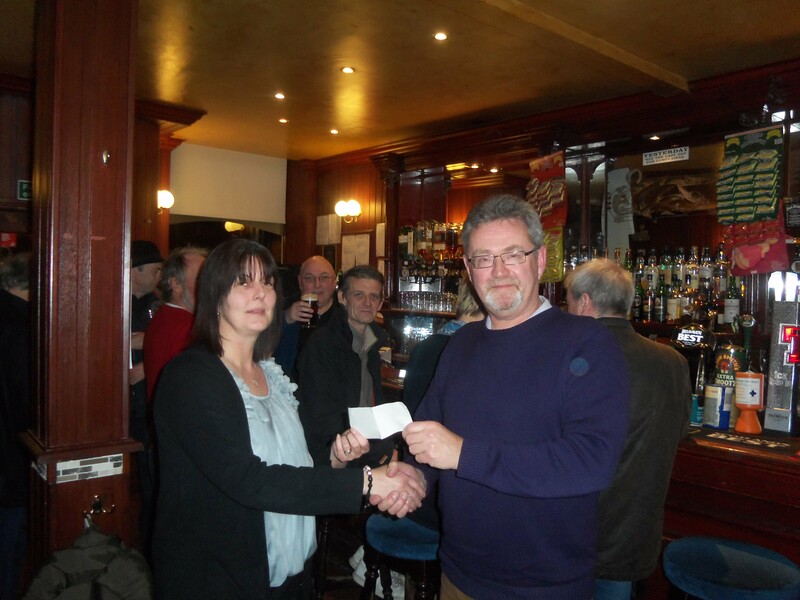 He was accepting a cheque for £60 from Brechin Arms being the proceeds from a collecting can on the popular pub’s counter. The Society has now almost reached the necessary sum to have the already completed statue placed on a specially constructed plinth in St. Ninian’s Square. It is hoped that this will be done sometime in May of this year. Dig down the back of the sofa, empty your pockets of change. Raid the piggy bank and please donate to us. Every penny you donate to The Watson-Watt Society of Brechin will be used to realise the projects and events which we currently have under way and in the planning. Robert Alexander Watson-Watt was born in Union Street, Brechin, in 1892. He showed an early interest in science, spending many hours experimenting in the workshop of his father’s joinery business. He won a scholarship to Brechin High and later to University College, Dundee where he took a degree in Electrical Engineering. Thank you for visiting our Website. We are very excited about the site and the opportunity to update our visitors and supporters with our latest news and developments. We invite you to look around our website and familiarise yourself with Sir Robert Watson-Watt and the great achievements made by both him and his team. And thus, with others I can mention, the victim of his own invention.